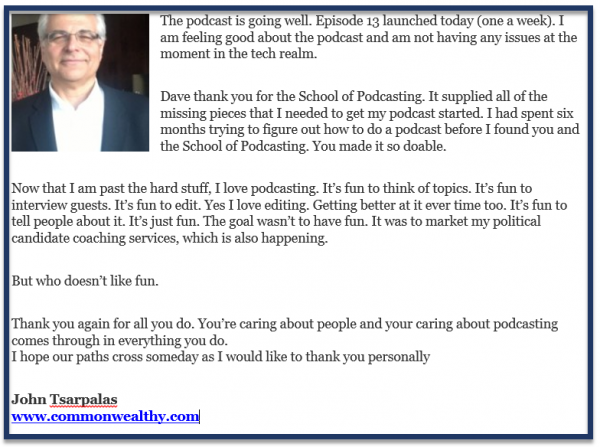 I can help you create a great sounding podcast that will position you as an expert in your field. I can help you do this while spending less an Xbox gaming system. I can make sure that you never look stupid. My podcast about podcasting has been downloaded over 1 million downloads, and has been featured in the "What's Hot" Section of iTunes and been received multiple nominations for podcast awards. I can help you do the same. What most people do when lacking the confidence to start podcasting is they listen to podcasts, watch YouTube, read outdated books and outdated articles on the Internet. But for most people, none of that works. They often think they have to spend large thousands on equipment (you don't). They quit before they get to episode 8 because their workflow is complicated (I can take the pain out of content gathering). They miss the daily opportunities to grow your audience the longer you wait. Much like a recipe, you don’t know if the recipe is any good until you cook it. You can read about podcasting for weeks (in some cases YEARS) but won’t know if you’re any good until you press record. You can learn to podcast by reading about it. You need to take action. If you just keep doing what you’ve been doing? You get frustrated. This hurts your self-confidence which then fuels your imposter syndrome and negative thinking. It snowballs and you eventually give up on your dream of inspiring, entertaining, and educating your audience. Opportunity lost. I’ve got an answer that works. Here’s the story: I started off a shy teenager grocery clerk who got fired for being too shy and not talking to customers (so I completely understand "Imposter syndrome" and not having confidence). A teacher told me to “Act the way you want to be, and some day you will be the way you act.” Through the years I’ve applied this and I know it works. When I started my podcast, there were other “Gurus” in my genre and I was intimidated. I pushed forward and started my podcast, I got guests I thought I’d never get on my show, and a short period later the “Gurus” were asking me to be on their podcasts. I was asked to speak at events because I was seen as the expert in my field. The road to podcast success had its ups and downs. I purchased the wrong equipment, and used the wrong software. At first I had “not so great” audio quality. That’s good for you as I can help you avoid the same pitfalls, and keep your money in your wallet. You can avoid having a drawer full of microphones that you don't use. I've done it for you. Over the years I’ve been hired because I knew how to podcast. I’ve been able to interview people who would never give me the time of day (but did because I had a podcast). I’ve made money recommending products I use. I've gown a successful consulting business. I served as the Director of Podcasting for the New Media Expo. I got the Director of Podcasting job because the head of the expo asked some experts who to hire -and everyone he asked listened to my podcast. Boost your confidence by creating content that positively impacts your audience. Get your podcast listed (in record time) in the top directories like iTunes, Stitcher, Tunein and more. Enjoy live “Office Hour” webinars where you can get your podcast questions answered and network with other podcasters. What can you expert to learn? The monthly plan gives you access to ALL of the courses available, so you can find exactly what you are looking for. You get immediate access upon signing up and can begin viewing the step-by-step tutorials on your computer, iPad, or Smart Phone. You can learn from anywhere. If you had me coach you on these hours of topics it would cost you thousands of dollrs. And you are 100% safe to try this out. That’s all I’m suggesting. Just try it for 30 days to see if it works for you. If it does, you’ll be delighted – and I think that’s exactly what’s about to happen. 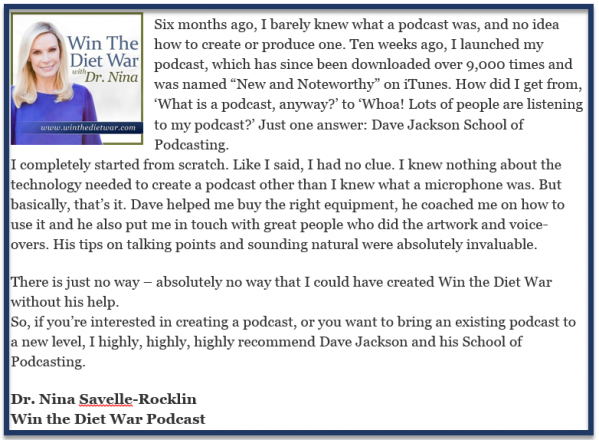 If for some reason you’re not delighted with the School of Podcasting, then just let me know – and you get all your money back. You have a choice to make: Do what you’ve been doing (or worse, do nothing at all). You know where that will lead. Frustration, Depression, and Lost Opportunities. Is that really where you want to go? Take a new action, and get a new result. Finally launch a successful podcast into iTunes that impacts an audience on a global scale. Which do you really want for yourself? Here’s what to do now… choose the options that best fit you. Pricing starts at $49 a month, and if you order a year it's like getting two months free.